Physics is a fair but harsh mistress. For while the heatspreader on your CPU – and the base of your CPU cooler – may look smooth, flat and able to make perfect contact, this is far from the case. Microscopic surface imperfections present on all metallic surfaces work against the movement of energy, by preventing proper contact and thus reducing the efficiency of heat transfer. 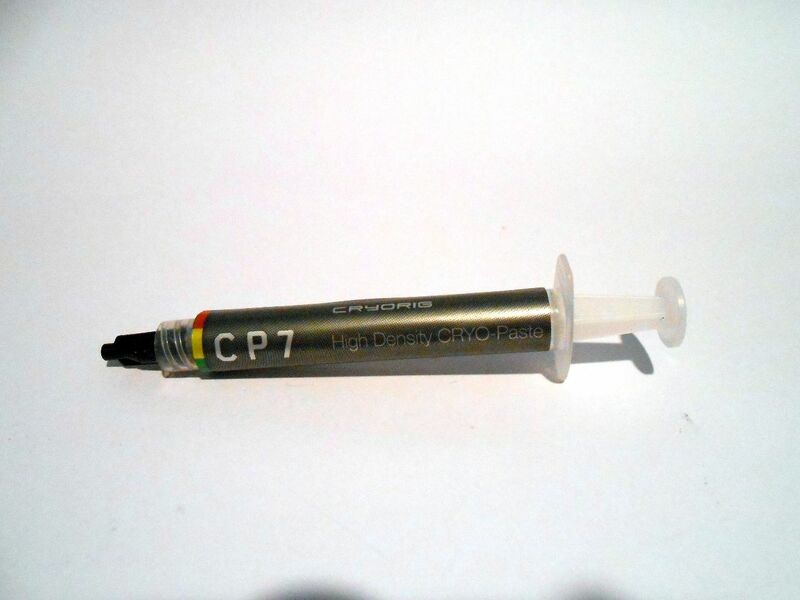 And while this can be improved with better machining (and in extreme cases, careful lapping of the surfaces), us mere mortals must suffice with the use of thermal paste to bond surfaces together. Especially when one considers common convex and concave surfaces, different design aims between manufacturers, and the sheer cost of better quality manufacturing, this is a necessary evil. But it may not be a terribly difficult or expensive evil to control. 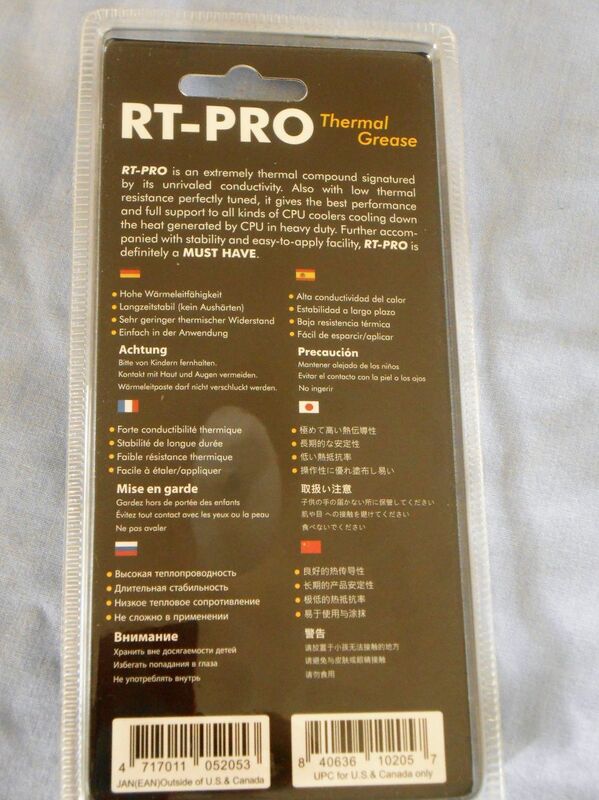 Why do we need thermal paste? Nothing is perfect. 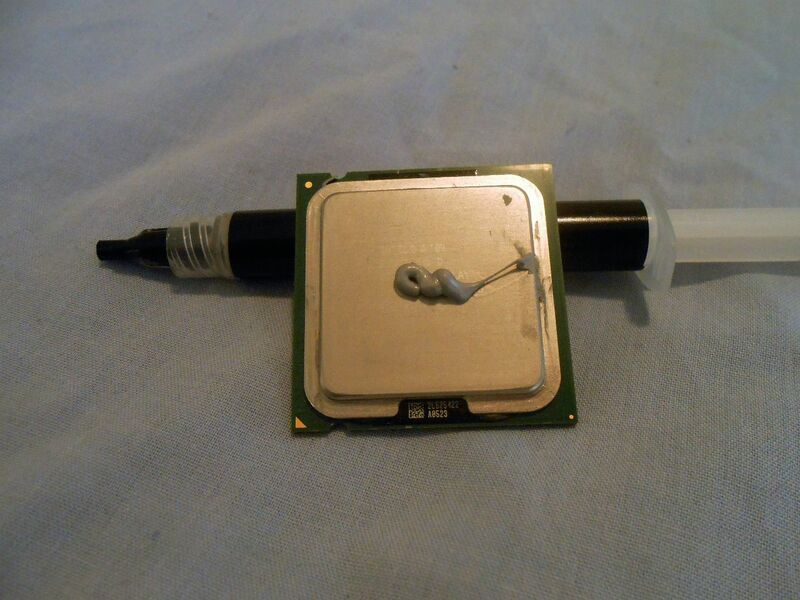 If you used a high powered microscope to look at the surfaces of your cooler and your CPU heatspreader, you would find that they have a rough surface that belies the smooth finish perceptible to the naked eye. Microscopic variations, ridges, spikes and divots exist in these surfaces, as a result of imperfect manufacturing. And in the collective abrasions across these surfaces, a lot of air is to be found. As air is a poor heat conductor – and, in fact, one of the best natural insulators out there – even the thinnest and most dispersed cushions of air can dramatically impact thermal performance. So we need something to fill these gaps. In the crudely drawn image above, the grey represents a concave CPU heatspreader, the orange represents the heatsink. On this microscopic scale, a large gap is formed bu the irregularities in the surfaces. 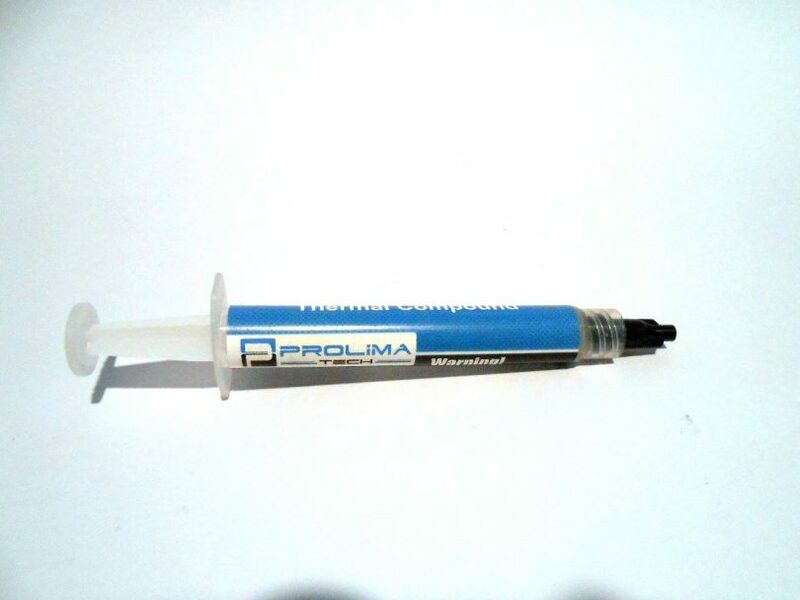 To this end, thermal compounds (pastes, glues and pads) were created to aid in the effective dissipation of the heat produced by components. So let’s look at the four products we are testing today in more detail. *Note: The below specification tables will vary considerably in their content, this is due to the limitations in published specifications for each product, which is beyond our control. 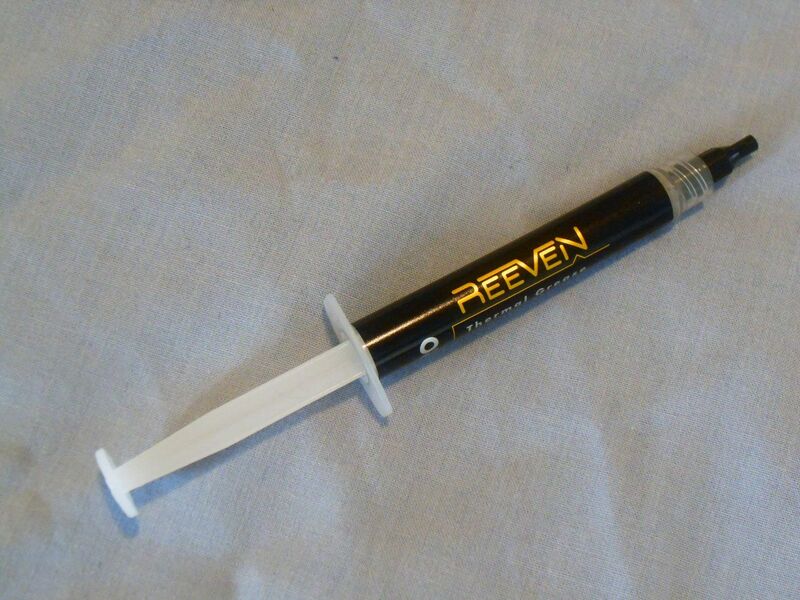 This paste, the newest addition to the roundup, is from Reeven, the same manufacturer that provided the previous three CPU cooler reviews. This one was thrown in as a bonus review with the smallest of their coolers, the Vanxie. 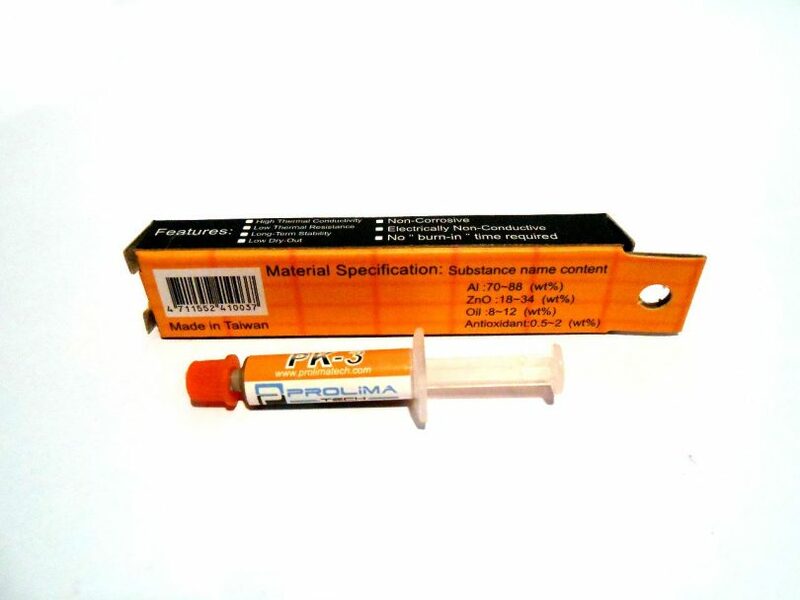 The technical specifications are very minimal, with the website and the packaging only listing the volume of the paste! 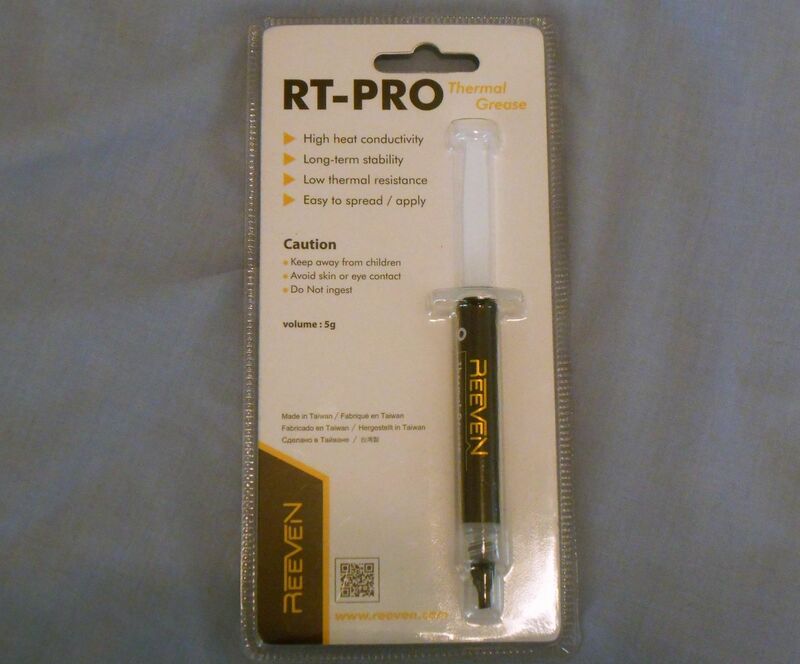 The price listing on the RT-Pro was the only retail listing I could find for this product. 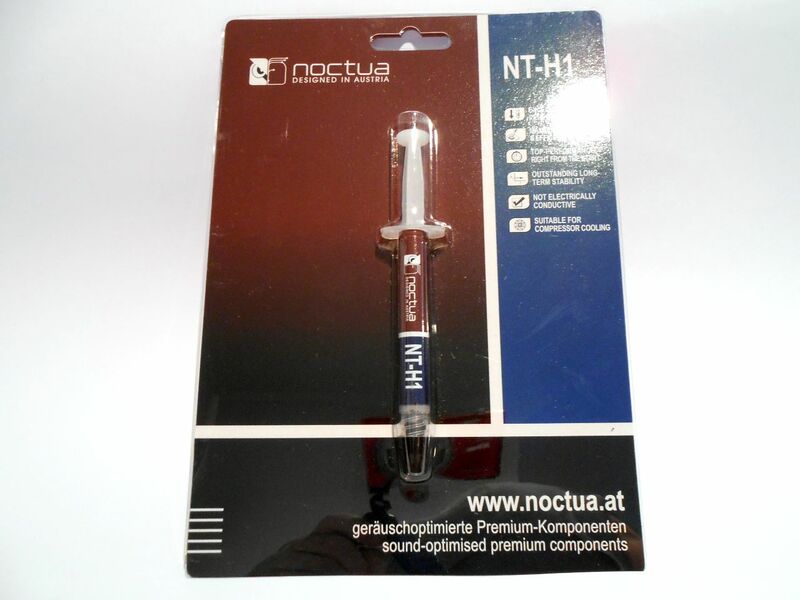 Noctua NT-H1 is sold as a standalone product, or bundled with all of Noctua’s CPU coolers. The standalone product comes in an attractive package, designed to be displayed in a shop hanging from a hook. Thankfully, this glossy plastic front is easy to remove to access the product, as it is just a simple cover, rather than the horrible heat sealed deathtraps that are the bane of the modern world. 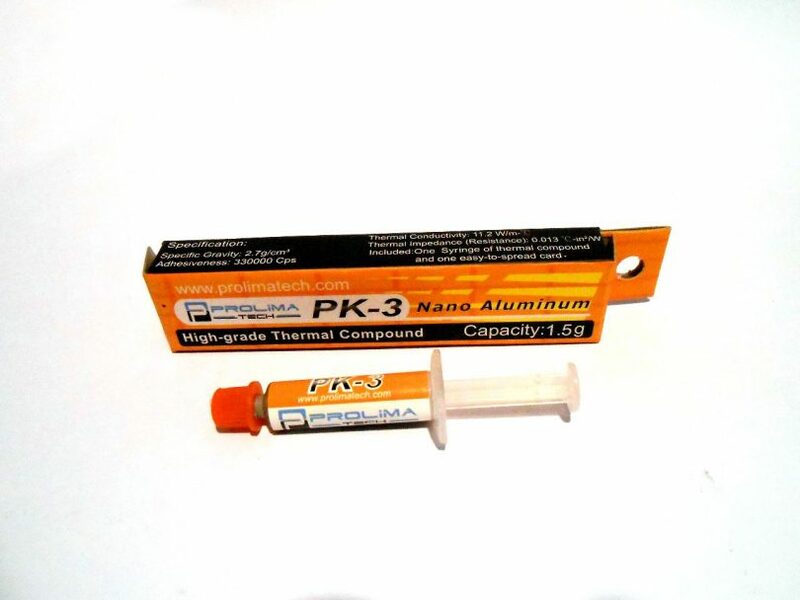 Prolimatech’s PK-3 standalone product is very much like the NT-H1 above, however it does not appear to be bundled with any of Prolimatech’s coolers. 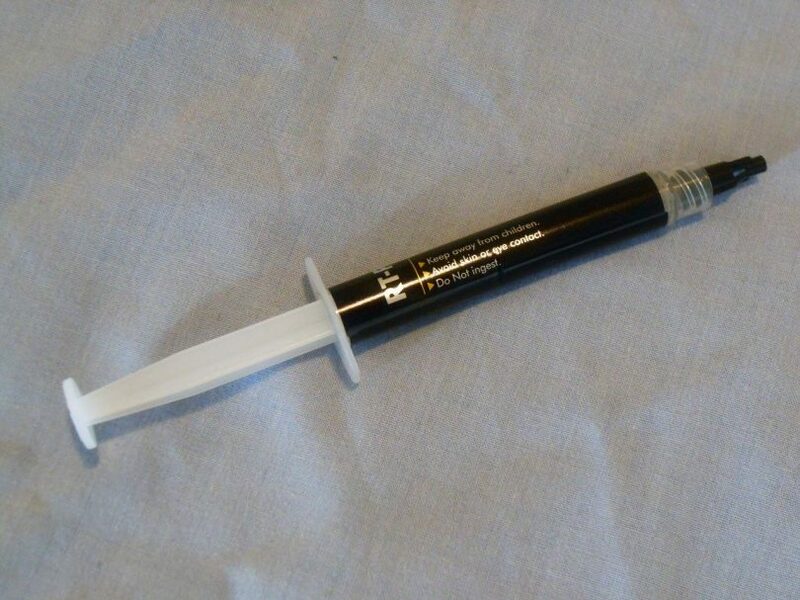 This is a significantly smaller tube than the other products in today’s roundup, though it surprisingly has the same included volume of paste. Although less packaging is almost always a good thing, application of the paste may be an issue for those, like myself, who are hamfisted. Practicing a steady hand may be wise. We’re back to a full size tube, with the same brand no less (albeit, once again, of a similar volume). It appears the company who supplies the empty tubes to CRYORIG also supplies them to Noctua, Reeven and Prolimatech, as they appear to our eyes to be completely identical. That’s an interesting niche to be in, to be sure… However, CRYORIG does fill the tube a lot more, with the CP7 coming with over twice as much paste per tube! Talk about value. A significant change from our testing system was needed for this test session, as we needed maximum heat throughput to really see which paste comes out on top. Consequently, I used my old personal workstation for this testing, the specifications for which are below. Each paste was applied in turn, with a grain of rice sized portion applied in a single dot to the centre of the CPU heatspreader. The system was then booted, and the Prime95 Small FFTs was run on all 8 cores, for 10 minutes. At the end of 10 minutes, the CPU core temperature was recorded using SpeedFan, and the ambient temperature measured using a discrete digital thermometer. The system was then shut down, and the paste cleaned off and reapplied. During load testing, the single Noctua NH-A15 150mm fan is run at 12v, with no speed control. 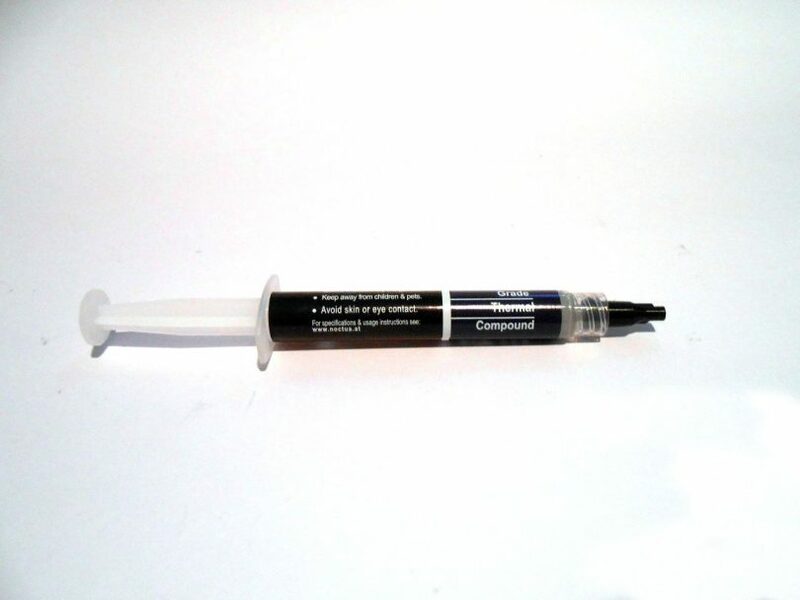 Each paste had 3 individual applications, to ensure accuracy and repeatability of results. These results were then averaged. Well… that was unexpected! All pastes performed comfortably within a margin of error, with no anomalous recordings on any of the 16 test runs. This is interesting, as in previous testing that I’ve done, I have seen some more significant variation on other products. 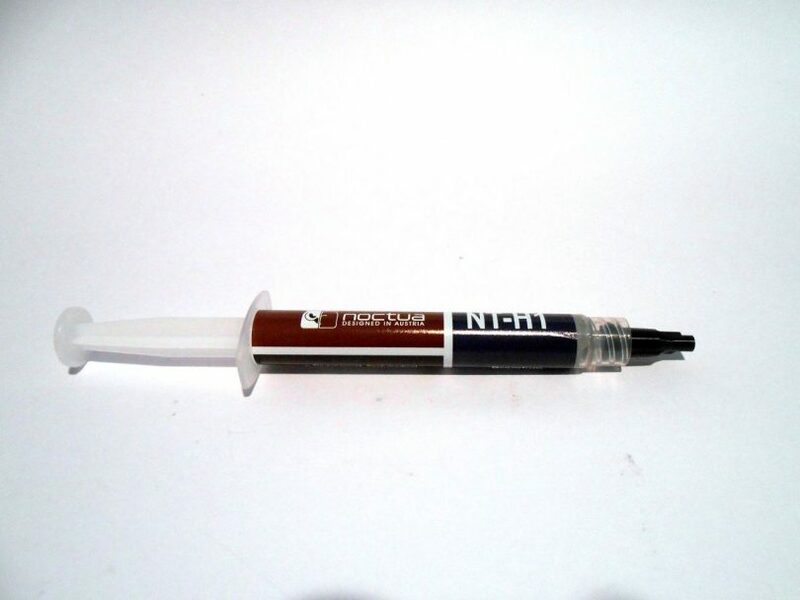 However, those tests were quite some time ago, so based upon this (albeit small) product sample, it appears that thermal paste technology is hitting the point where it doesn’t really matter what paste you buy, as long as it is a reputable enough brand. As an aside, I did experience two of the 5 pastes in this test ‘glue’ themselves down, and exceed the AM3+ retention strength – the cooler pulled my CPU right out of the locked socket! These were the Noctua NT-H1 and Prolimatech PK-3 pastes. Keep in mind that AMD spec for the socket is a minimum of 0.013 kgf per pin, meaning that, at the very least, 12.2 kg of force is required to pull an AM3+ CPU out of the socket with the retention lever down. 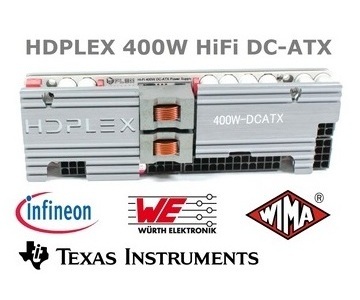 This is equivalent to being able to hold the weight of nine Noctua NH-D15 coolers and the fans! Review samples provided by Reeven, Noctua, Prolimatech and CRYORIG.